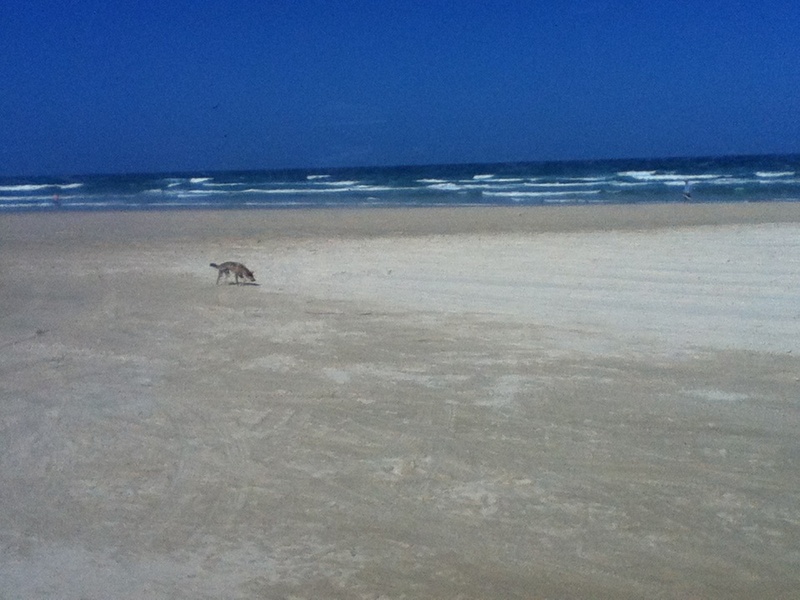 The past 3 days we have been on Fraser Island just off the east coast. It was an amazing experience and a definite highlight. Fraser is the largest sand island in the world and the vegetation literally grows out of the sand. There are only a handful of roads and we drove around in 4-wheel drive coaches on the sand tracks and beaches. It was a very bumpy ride as the sand was so soft, and there were definitely some screams from us when the bus tipped and rolled around! We saw so many feats of nature including Eli Creek which was a crystal clear creek that you could literally float along. And Lake Wabby which was a lake at the bottom of huge vast sand dunes, so we could run down the dunes right in to the water! We got to go paddle boarding again too but not quite so successfully this time as the water was pretty rough. Another amazing place where we swam was called Champagne Pools – where waves crash over rocks creating foam that looks like champagne! The wildlife was incredible – we saw wild dingos, mantarays, a pod of dolphins, sea turtles and a tiger shark. Then we went on a spontaneous scenic flight in a tiny little plane that took off from the beach, from the air we spotted 3 humpback whales and could see their entire bodies under the surface of the water! The flight was a bit scary (for Cordelia) as the plane kept squeaking and wobbling, but overall an amazing experience. Although we were staying in our first ‘resort’ (backpacker dorms but the use of a jacuzzi and fluffy towels..!) we weren’t safe from the perils of Australia… One evening Cordelia went to retrieve something from her bag and a cockroach crawled out ahhh. It took us 45 minutes with Dee supporting from the safety of the bed while Kels bravely killed it with a flip flop wrapped in a tissue. All in all a very stressful experience and a learning curve – who knew that cockroaches can fly (or at least jump)?! Off to Brisbane again tomorrow, then Byron Bay, Sydney and Melbourne yehaah!